Here's some good news for mobile casino players: there's another new game in the Grande Vegas Casino mobile casino! Small Fortune, a picnic-themed game, has been popular in the online casino since it launched a couple of years ago so you may have already played it on your desktop or laptop computer. Now you can enjoy it on the go on your smartphone or tablet. To celebrate the new game Grande Vegas will double deposits up to $150 until the end of this month. Small Fortune Mobile Casino Bonus Get a100% up to $150 casino bonus by entering coupon code SMALLMOBILE when you deposit. 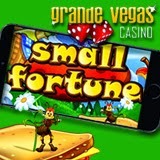 Small Fortune is a 25 payline picnic-themed slot game from Realtime Gaming. It has two random jackpots and grouped Wilds. No picnic is complete without sandwiches, lemonade, cherry pie – and of course ants, which are Wild. Five Cherry Pies pays 1250X the winning bet. Up to 45 free spins are triggered when Ants appear on reels 1 and 5 and a Picnic Basket appears between them on at least one of the other reels. Free game prizes are multiplied by the number of Ants appearing in the triggering combination. Small Fortune has a wide betting range to suit all kinds of players. The minimum bet is only a penny per line but, if they’re feeling lucky, players can place a max bet of $125 per spin. There are two random progressive jackpots. While the Minor Jackpot doesn’t usually go over $1000 the Major Jackpot can pay several thousand.